The USA Pickleball Association (USAPA) has hit a home run for pickleball. And Indian Wells Tennis Garden has positioned themselves as the host of pickleball’s premier sanctioned tournament event. I am certainly not the keeper of all the details of this new pickleball marriage, but here is what we know so far. It’s ALL GOOD. This agreement is to host the USAPA National Pickleball Championships for the next FIVE years. Key word “FIVE”. As soon as the word came out from the recently completed USAPA Ambassador’s retreat/conference, anyone who has ever visited, or Googled and looked at pictures of, the Indian Wells complex, began to scream and moan and groan about how the Tennis Garden has no “real” permanent pickleball courts. Shame, shame, shame on those short sighted party poopers for trying to rain on the parade of the best deal the USAPA has ever made to promote and grow our sport to major status. Now before you start penning your blasting emails or comments, let’s think a little bit about what just happened. The INDIAN WELLS TENNIS GARDEN is an international professional tennis and Pickleball venue owned by Mr. Larry Ellison, co-founder of Oracle Corporation. This 77 Million Dollar sports complex includes 29 world class courts and two tennis stadiums. Stadium One is the second largest tennis stadium in the world at 16,100 seats. Enjoy Pickleball under the lights each Wednesday night, 5:00pm to 8:00pm. Enter Gate 7 on Miles Avenue and check in at the pro shop. Now, yes they have only been playing pickleball there for a short period of time and yes it has only been on temporary courts so far. But thinking that what the Tennis Garden looks like now, is what the Tennis Garden will look like in November is truly missing the point of why Indian Wells signed this agreement. As you may have noticed in the Places To Play listing, Larry Ellison is the owner of the Indian Wells Tennis Garden. Coming from my personal background in Information Technology, I have known of, and been a fan of Larry Ellison for a long time. He is always listed in the top ten wealthiest Americans and yes he plays and enjoys the sport of pickleball. So let’s talk about what really happened in this FIVE YEAR deal between USAPA and Indian Wells. First, Larry Ellison purchased the Indian Wells Tennis Center and has paid ten’s of millions of dollars to make it into the world class tennis facility it is today. Each year it hosts the fifth largest tennis tournament in the world, the BNP Paribas tournament. But besides the Tennis Garden, Mr. Ellison also purchased $30 million dollars worth of land next to the Tennis Garden. This land is a grass parking lot at this point. Keep that in the back of your mind for the future. To read more about the transformation of the Indian Wells Tennis Garden from the time Larry Ellison purchased it, here is a great article. So Larry Ellison is not known for doing things on a small scale. Don’t think that associating his tennis complex with the USAPA Pickleball Nationals for the next five years will be any different than any other project he has tackled. Indian Wells would NOT be bringing in a pickleball event if it didn’t believe in making it first class. So what will it take to transform Indian Wells Tennis Garden into a world class pickleball facility????? The real answer is NOT MUCH. Think for a moment how hard it is to transform a tennis court into 4 brand new pickleball courts. IT IS EASY, EASY, EASY. 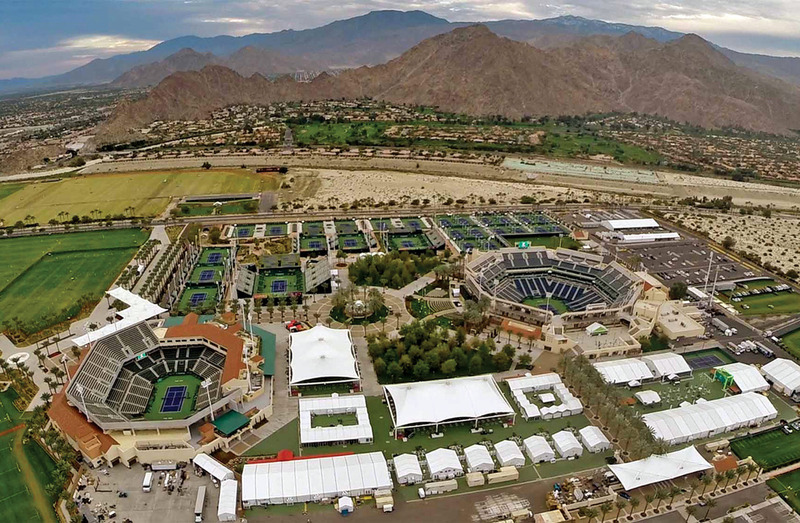 The big point that I’m trying to make is that the Indian Wells Tennis Garden is a $77 million dollar complex with loads of resources at their disposal. Big tennis complexes resurface, repaint and rearrange courts as easily as you and I change shoes. They could have as many permanently striped pickleball courts ready to go as they want within weeks. I know they can convert a stadium court into a stunning Gold Medal Match court in very little time and at a mere drop in their operating expense bucket. So remember, the Indian Wells facility and organization has five years to work with the USAPA. I believe the only question is, will they choose to do all the 40+ pickleball courts needed to host a nationals this first year or do they do the permanent courts in in a graduated fashion. Those are details that we don’t have yet. But I also believe that if some courts have tempy nets, they would be something like the heavy duty outdoor nets that are quickly becoming popular with larger outdoor tennis facilities around the country. 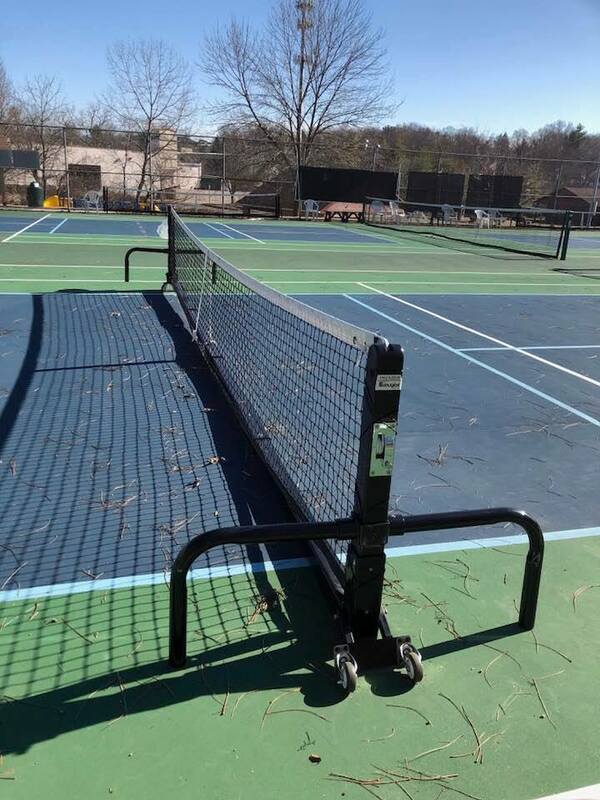 The Douglas pickleball nets are very heavy duty, outdoor, tennis quality portable nets. They play just like a permanent net. So I am extremely confident that year one will be a great show for pickleball. Yes, I believe the USAPA has hit an absolute home run for the sport of pickleball. And yes, I believe the Indian Wells Tennis Garden has hit one too.